Microgrid Market size for 2016 was valued over USD 4 billion and the capacity is set to exceed 6 GW by 2024. Government measures to electrify rural and urban areas coupled with integration of renewable energy technologies will foster the microgrid market size. Increasing demand for reliable and uninterrupted supply of electricity from off-grid areas will further augment the business growth. Ongoing deployment of distributed power generating plants will further stimulate the industry outlook. The World Bank in 2014, approved a loan of USD 4.70 million to enhance the power services for rural areas and community halls in Vanuatu. Growing concerns pertaining to security of supply coupled with regulatory inclination to balance load on central grid system will drive the microgrid market share. Increasing penetration of captive power plants in the manufacturing and industrial sector will further embellish the business landscape. In 2015, the RINL launched a 120 MW captive power plant to provide energy to their Vizag steel plant and to reduce dependence on state grid. 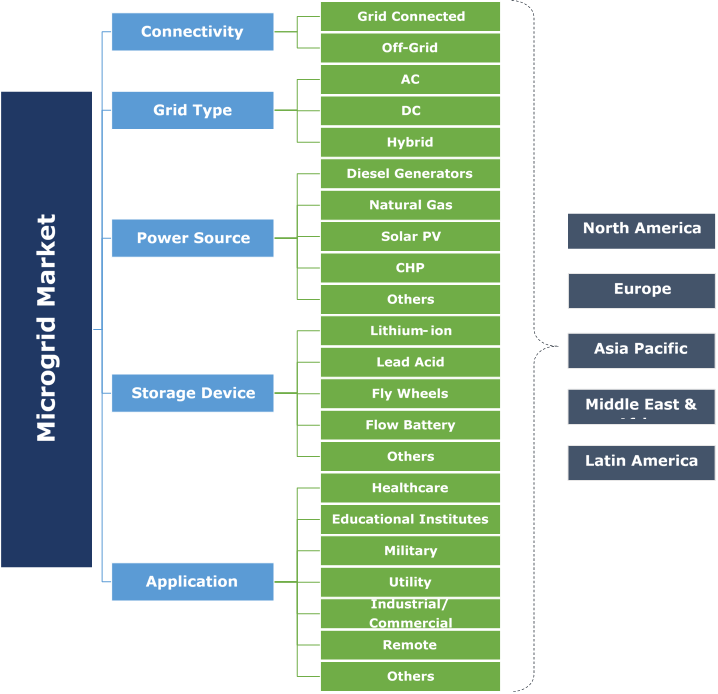 Grid-connected microgrid market is set to grow pertaining to increasing demand for reliable and continuous power supply along with integration of sustainable energy technologies. The Government of Portugal has established Evora microgrid project in order to provide energy forecast, by simultaneously reducing T&D losses, and curbing CO2 emissions. Off-grid connectivity has witnessed a significant penetration over the years owing to growing government initiatives to provide power to all citizens along with ongoing development of decentralized energy sources to strengthen the power infrastructure. In October 2016, the French technology company Electro Power Systems installed a microgrid of 4.1 MW in Maldives. DC microgrid market is predicted to reach over 2 GW by 2024. Integration of several distributed generation technologies including solar PV systems with direct DC grids will positively impact the industry growth. Cost effectiveness, reliability and high efficiency are some of the key features which will encourage the product adoption. The Burlington DC microgrid project is installed at headquarters of Etratech Corporation in the U.S. The project includes rooftop solar panels, 5-hour duration flow battery and natural gas DC generator. 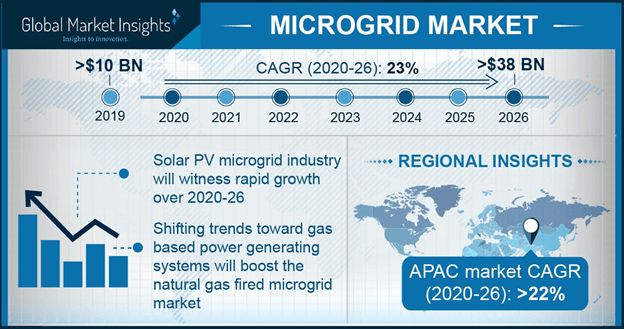 Hybrid microgrid market share is set to witness strong growth on account of ease of compatibility with AC, DC grid and sustainable energy technologies. Growing adoption of the technology across remote areas will further propel the business landscape. In May 2017, Enel started operating “Plug & Play” microgrid comprising of solar PV facility of 125 kWp and two energy storage system based on hydrogen and lithium storage of total capacity of 580 kWh. Combined Heat & Power (CHP) microgrid market is predicted to grow over 19% by 2024. Low operating cost, declining gas prices and higher efficiency are some of the key parameters that will boost the product penetration. Solar PV in 2016 accounted for over 12% of the global microgrid market share. Favourable government initiatives toward upscaling of sustainable power generation capacity will foster the business growth. Declining prices of solar PV components along with technological advancement in product design and development will further complement the business landscape. The global panel cost in 2016, witnessed a decline of over 20% as compared to the prices in 2015. Lithium-ion in 2016, accounted for over 50% of the global microgrid market share. High volumetric and gravimetric densities along with improved life cycle will drive the product demand. Declining product prices and mass production by leading industry players will complement the business outlook. Lead acid batteries is set to witness slow growth on account of technological advancement and high-power density offerings by its competitive counterparts. Stringent government norms pertaining to emissions may further restrain the growth. Paradigm shift toward hybrid systems and redox batteries for energy management at remote locations has integrated an intense competition across the industry. Microgrid networks across educational institute is set to grow owing to ongoing investments toward private substations coupled with growing demand of power from institutes in remote areas. In 2016, Schneider Electric signed an agreement with REC Solar to build a 400-Kilowatt microgrid system at its Boston One Campus. Industrial/commercial microgrid market was valued over USD 450 million in 2016. Extensive power requirement for lighting, manufacturing operations, hospitals, offices and retail outlets will complement the industry growth. According to EIA, the commercial sector accounts for 4% and industrial sector accounts for 22% of the primary energy consumption in the U.S. The U.S. Microgrid market is predicted to grow pertaining to ongoing adoption of self-power generation plants along with enhancing distributed power generation technologies. Increasing investments across infrastructure and energy sector in the country will further propel the business outlook. In 2016, USD 712.5 billion were spent to boost infrastructure sector in the nation. China microgrid market is set to exceed 1 GW by 2024. Exponential rise in power consumption along with increasing investments across the commercial and industrial development will embellish the business outlook. Favourable government initiatives toward rural electrification coupled with integration of sustainable energy technologies will propel the product penetration. Favourable government policies coupled with rapid deployment of solar PV and wind energy units to sustain the growing energy demand will positively influence the Denmark microgrid market outlook. In 2017, Denmark Ministry of Energy, Utilities and Climate announced an incentive scheme of USD 16.5 million for solar PV projects not exceeding 1 MW in size. Eminent industry players in microgrid market includes Eaton Corporation, Siemens Ag, GE Alstom, Schneider Electric, ABB, Caterpillar Inc, Homer Energy LLC, Power Analytics Corporation, EnSync Inc, Lockheed Martin Corporation, Honeywell International Inc, Viridity Energy Inc, Exelon Corporation and Advanced Microgrid Storage. Growing R&D investments along with strategic partnership and alliance has been a key strategic inference by leading industry players. Decreasing capital cost along with economies of scale in long run has further established strategic platform for expansion. Microgrid are small energy system that are capable of balancing captive supply and demand resources to maintain stable supply of electricity. They contain loads and distributed energy sources including storage devices, controllable loads and generators and can function in coordinated and controlled way either when connected to the centralized grid network or when islanded. Prime applications of these networks are in military, utility, remote locations, industrial and commercial sector.